Contact Forms are one of the key elements of websites that allows the visitors to communicate to the site owners through mails. Since Bootstrap is only a front end framework we should use server side script like php to make the contact form fully functional. 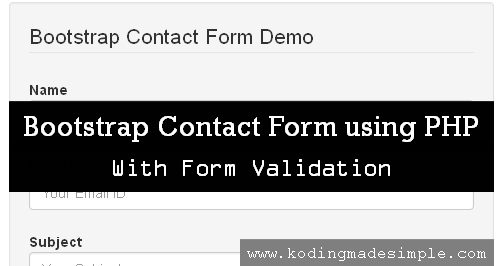 Here in this tutorial, we'll see how to build a bootstrap contact form using PHP along with form validations. We are not going to use any java script library for validations as all the validations will be done in the server side for maximum security. The contact form we are going to build is a clean minimalistic design that contains input fields for name, email, subject and message. Once the user fills out the form and submits it, all user input will be checked for validation errors. If there is any error, it will be displayed in the form else a mail will be sent and notified to the user. First let's write the required html markup to build the contact form in bootstrap. Creating web forms with bootstrap is a breeze with all that built-in classes available. This twitter bootstrap contact form is a responsive one which means it shrinks to fit well in mobile screen. Here goes the html markup for the form. As you can see in the above markup, bootstrap css classes for form have been used along with the html elements. We make sure to center align the form to the view port (screen) using the classes "col-md-6" and "col-md-offset-3". Adding "form-horizontal" class to the html form element will make use of the bootstrap grid system to align the labels and the form group elements in a horizontal layout. Also we have used bootstrap's role="form" attribute for easier accessibility. We have used <span> element with "text-danger" class below each form input to display the validation error. This displays the error messages in red color below the input field in case there is any error. Additionally we also repopulate the form fields with the user input using the "value" attribute in case of validation error like this. Next we'll move on to php script where we collect the contact form data and send mail. Let's set an error flag as false to indicate of no validation error in the contact form data initially. Next get the submitted form data and store in variables. The function trim() will cut down the preceding and trailing white spaces of the input. Next check for the validation error in the posted data. Here we check for the name field to contain only alpha characters and space. Using the regular expression with the function preg_match() will do the job. If you want to learn to more about using regular expressions, take a look at this article on using regular expressions for form validations in php. Next we check for valid email id using the filter_var() function. Using the token "FILTER_VALIDATE_EMAIL" will validate the given email id. For the subject and message field we check if they are empty or not. Finally we send the mail if there is no validation error. Note: In the above code change the "$toemail" value to the email-id you want to receive the mails. We use the php mail() function to send the email. If mail is sent without any error we display a success message to the user like this. In case the mail is not sent due to some technical error we notify a failure message to the user like this. Here is the complete php bootstrap contact form code. 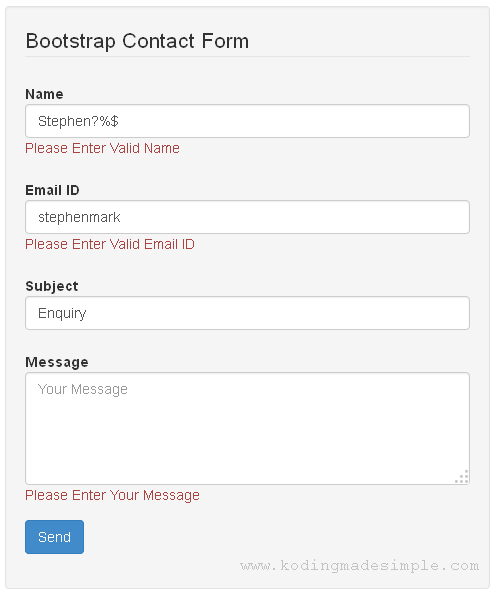 Now you might have a better understanding of using php to build twitter bootstrap contact form. Hopefully you have enjoyed reading this tutorial. Please don't forget to share it on social networks. what do i have to save the php code as to link it to my form. and why is the value displaying in my text field, instead of my place holder? Hi, for question #1, I have included the php script in the same contact form and used "action= echo $_SERVER['PHP_SELF'];" which loads the same file when the form is submitted. Else you can save the php code as a separate file say "sendmail.php" and link it to the form "action" attribute. For question #2, sorry can you be more precise? thank you very much, I have adapted your code to my page, all credits to you. Glad it helped you! Cheers. Thanks so much for this! I've never worked with PHP before, so this made it really easy for me. I was wondering if there's a way to keep the page on the contact form after the email goes through. Right now after I click submit as a user, it kicks me back to the top of the page and I have to scroll back down to see the successful submission panel. I'd love for users to just instantly see if their message succeeded or failed. Welcome Kelsey:) You can display the success msg at the top of the form so that it will be seen the fold. I have done it, but whenever I submit the form with all fields or with incorrect field, it direct me to the top of the page... Please help. Why the hell does this ["] show up in my text field? I adopted the page for my own website - The form works which is great so thank you. my two pages are both PHP. The form is sending a message but it's redirecting us to the html_form_send.php page instead of showing me "message sent successfully/ there is an error" - any help? It works beautifully - the error I made was having the PHP in a separate file and then referencing it in the action. Sticking to PHP self is the best solution. :) Thank you very much for this. Glad it works for you! Cheers. to make it more secure? Getting my info from: http://www.w3schools.com/php/php_form_validation.asp about half way down the page.